Berlin is the largest city and capital of Germany. The history of Jews in Berlin can be traced all the way back to the 13th century. Jews first arrived in Berlin at some point in the 13th century. Prior to this period, German Jews had lived primarily in southern Germany, in communities along the Rhine. But in the 13th century, the Jews began to migrate to the cities of the north, to escape the persecution and expulsions that had become a constant since the Crusades began in 1096. Unfortunately, the Jews would not find matters much better in Berlin. In fact, the first time they are mentioned in any city documents is in an ordinance enacted in 1295, forbidding wool merchants to sell yarn to Jews. In the following centuries, they continued to be the target of oppression. In 1349, the Jews were accused of starting the Black Plague that was sweeping through Europe, and were expelled – but not before many were killed, and had their houses burned down. The Jews were allowed back in 1354, but were expelled once again in 1446. In 1510 and 1571, the Jews were again expelled en masse, after having been allowed to return in between. The motivations behind these expulsions varied: in 1510, the exile followed an unfounded accusation of host desecration; in 1446 and 1571, the Jews were simply told to leave so the government could confiscate their property. Between expulsions, the Jews of Berlin were primarily engaged in money-lending and petty trade. They lived in a ghetto in the Grosser Judenhof (“Jew’s Court”) area, and on Juddenstrasse (“Jew Street”). Following the expulsion in 1571, virtually no Jews inhabited Berlin for a century. This changed in 1663, when the elector of Bradenburg allowed Israel Aaron to enter Berlin as a Court Jew. Soon afterwards, in 1671, 50 prominent Jewish Viennese families were allowed into the city as Schutzjuden, protected Jews who paid for a residence permit allowing them to engage in certain businesses and worship in private homes. The Jewish families were also given a cemetery, a mikveh (ritual bath), and a hospital. In 1714, the first synagogue, known later as the Old Synagogue, was established at Heidereutergasse in Mitte. This community grew despite the restrictions on residence and family size, and by the beginning of the 18th century there were approximately 1,000 residents of the Jewish ghetto. The community paid a great deal of its income in taxes: a protection tax, a residence tax, a head tax and a payment required to work in certain professions were all used at one point or another to extract money from the community. Nonetheless, the Jews excelled as merchants, mainly selling precious metals and stones, and as bankers. Soon, they were among the richest people in Berlin, and by the halfway point of the 18th century the Jewish population of Berlin totaled 2,000 people. Philosopher and scholar Moses Mendelssohn arrived in Berlin in 1743, and urged Jews to integrate into secular society. Mendelssohn was involved in the founding of the Juedische Freischule (Jewish Free School), that combined religious learning with a general education. Today, the private Jewish High School located at Grosse Hamburger Strasse 27 is open to both Jews and non-Jews alike, and is in the same building the Free School occupied from 1906 to 1942. Mendelssohn was laid to rest in Berlin in Vestpocket Park, which was used as the Jewish cemetery from 1672 to 1827. In 1845, the Society for Reform in Judaism (originally begun in private homes), was founded in Berlin. The Society boasted a revised liturgy, organ music and Sunday services. The Berlin Reform Temple was built in 1854 at Johannistrasse 16 and survived until the aerial bombing of the city during World War II. In 1866, a third synagogue that featured this new type of modern Judaism, the New Synagogue, was established at Oranienburgerstrasse, and included an organ, a choir, and services in German. It became the center of liberal Judaism. As a reaction to this liberalization of the religion, a neo-Orthodox synagogue, Adass Jisroel, opened in 1869 under Rabbi Azriel Hildesheimer. The congregation survived at Tucholskystrasse until the outbreak of World War II in 1939. As the 18th century drew to a close, Berlin became the center of the Haskalah, or Jewish enlightenment, which came to advocate Jewish equality and secularism. Internal communal authority subsequently broke down, and many Berlin Jews moved out of the ghetto, and became unaffiliated with traditional Judaism. In 1815, the Jews succeeded in attaining Prussian citizenship and the various regulations and taxes that had unfairly targeted the Jews were rescinded, although full equality came in 1850 with Prussia’s updated constitution. By this time, there were 9,500 Jews in Berlin, mostly involved in finance, commerce, and transportation. As Berlin’s Jews continued to infiltrate the social and economic elite, their ranks continued to grow, despite skyrocketing intermarriage and apostasy. By the turn of the century, there were more than 110,000 Jews in Berlin, comprising more than 5% of the total population. Most settled in the center of the city, but by 1900, had started to move to the outer districts of Spandau and Stralauer, and then to Charlottenburg, Schoeneberg, and Wilmersdorf. 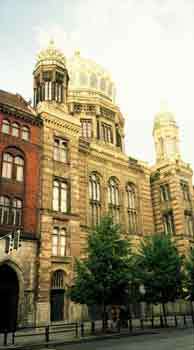 Communal institutions thrived as well: between 1880 and 1930, eight elaborate new synagogues were constructed, rasing Berlin’s total to sixteen. Numerous Jewish newspapers were founded, and organizations such as B'nai B'rith, Poalei Zion, and Hibbat Zion attracted many new members. At the same time, however, anti-Semitism was on the rise, and, in the years leading up to the Nazi’s ascendence to power in 1933, attacks on Jews increased. In the years between 1933 and 1939, as Jews in Berlin had their social and economic rights systematically eliminated, Jewish communal life increased dramatically: Jews could only send their children to Jewish schools, and could not interact with any citizens other than their own kind. In June 1938, the round-up of Jews began, as thousands were arrested without reason. On the evenings of the 9th and 10th of November, now known as Kristallnacht, Jewish synagogues and shops were vandalized and burned throughout Berlin. One of the synagogues set ablaze was the New Synagogue. The building was saved when a police officer, Wilhelm Krützfeld intervened and convinced the fire department to put out the fire because the building was an officially protected monument. The synagogue was later damaged in 1943 during Allied air raids. In the months that followed, more and more Jews were arrested or put to work at forced labor camps. Jewish communal life, however, remained vibrant. For two weeks in August 1936, the treatment of the Jews and other persecuted minorities in Germany was hidden while the Summer Olympics were held in Berlin. In an attempt to legitimize his rule, Hitler cleansed the city of incriminating evidence, so that the international community saw no sign of wrongdoing. Of course no German Jews were allowed to participate in the events, and as soon as the Olympics ended the mistreatment accelerated. By 1939, the Jewish population of Berlin had dwindled to 75,000. In 1941, things changed even more dramatically. Many more areas of the city were declared off-limits for Jews, and laws were enacted requiring Jews to wear the infamous yellow badge. Between 1941 and 1943, all the city’s Jews were deported to camps throughout Europe, and, on June 16, 1943, Berlin was declared Judenrein (“clean of Jews”). 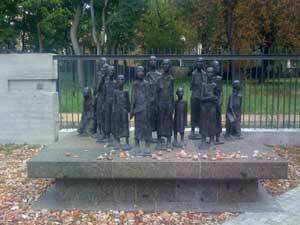 By 1945, only 8,000 Jews remained in Berlin. Those who survived were either in hiding or were married to non-Jews. In the aftermath of the war, some Jews came out of hiding and others returned to their homes. Berlin was universally considered a “liquidation city” – no one expected the Jews to have a future in Berlin, and thus it was assumed that all the residents would quickly emigrate. About 1,500 Jews survived the war by hiding out in Berlin. This assumption proved to be partially incorrect. While East Germany had few Jews among its inhabitants, West Germany, particularly the American zone, maintained a sizable community, bolstered by an influx of displaced persons, mostly from Eastern Europe, after the war’s conclusion. The Jewish community’s growth stagnated, then declined steadily until 1989. Then, the city received a “shot in the arm” when the Berlin Wall fell, and the Jews of East and West Berlin were unified into one community. They were joined by thousands of immigrants from the former Soviet Union, who, for the first time since the war, reinforced the traditional elements of the community and settled in areas with affordable housing like Wilmersdorf and Steglitz. Today, signs of Berlin’s Jewish history are everywhere. There are streets named after such famous Jews as Moses Mendelsohn, Baruch Spinoza, Rosa Luxemberg, Heinrich Heine and Gustave Mahler. There are numerous Holocaust memorials throughout the city, with the Memorial to the Murdered Jews of Europe in the center of Berlin recognized as the official German Holocaust memorial. An underground information center documents the Holocaust. A total of seven synagogues are in operation and there are Jewish preschools and a high school. In 2003, the first Jewish-oriented college was opened by NewYork-based Touro College. Berlin is home to Germany's official memorial to the Holocaust, Cora-Berliner-Strasse. 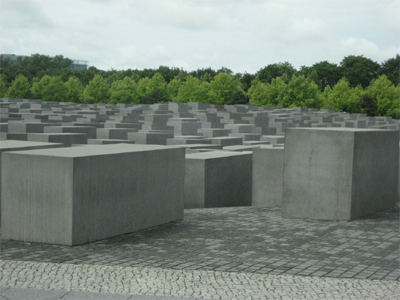 The memorial was opened in 2005 and includes 2,700 concrete blocks of varying heights, representing the coffins of those individuals murdered in Nazi concentration camps. The memorial rests on a large open piece of land in the center of the city, adjacent to the mound underneath which Adolf Hitler spent his last days and committed suicide in his underground bunker. Included in the many Holocaust Memorials scattered throughout Berlin are the Missing House graphic at Grosse Hamburger Strasse 15/16, which lists the names of former residents; a red sandstone monument at Rosenstrasse 2/4, which pays tribute to the protests of non-Jewish women over the capture of their Jewish husbands; and the Abadoned Room at Koppenplatz, which depicts an overturned bronze chair to remember those Jews taken on Kristallnacht. Other areas of interest include Bebelplatz, site of the May 10, 1933, book burnings; Track 17 in the Wilmsersdorf district, a commemoration to the more than 50,000 Jews that were deported from Grunewald Station, which features plaques next to the railroad tracks that list every transport between 1941 and 1945, the number of people, and their destination; and the Israeli Embassy, which hosts six stone pillars at its entrance to symbolize the 6 million Jews that perished at the hands of the Nazis. Also in Berlin, more that 5,000 Stolpersteine (stumbling blocks) have been set in the city's sidewalks and streets. Each plaque commemorates a victims of the Holocaust at that person's last known address. The stone lists the victim's name, date of birth, deportation date, and death date (if known). The idea and the stones are the work of artist Gunter Demnig, who says that “a person is only forgotten when his or her name is forgotten.” The first small memorial, embedded in the sidewalk, appeared in Berlin’s Kruezberg district in 1996. Today, the stones can be found in 916 places in Germany and more than 45,000 have been planted in more than 1,100 locations in 17 European countries. In what was East Berlin, Oranienburgerstrasse is emerging as a new center of Jewish life. The “New Synagogue” – which was constructed in 1866, and left in ruins after Kristallnacht and the Allied bombing of Berlin – has been completely renovated. The building’s gold dome and towers have been restored to their pre-war condition; rather than being restored to its original purpose, the huge main sanctuary now houses a museum of Berlin Jewish history, Centrum Judaicum, and is used as a cultural center. Down the road from the New Synagogue is the East Berlin Jewish community headquarters, which has also undergone renovations. Several kosher restaurants flank the building. The community center is located in Charlottenburg, and hosts a tourist desk for visitors. Further down Oranienburgerstrasse is a Jewish cemetery, in which Moses Mendelsohn is buried. On nearby Poststrasse, the “Ephraim Palais” remains standing. The building was erected in the mid-19th century by Veitel Heine Ephraim, a Jewish banker who celebrated the granting of Jewish equality by building what was then the city’s most magnificent mansion. Another historic East Berlin synagogue is that on Rykestrasse 53, which is near the historic Juddenstrasse where the Jewish ghetto was located in the 16th century. The Liberal-Conservative Rykestrasse synagogue was well preserved during World War II, and is still in use today. It was originally built in 1904. The synagogue has a beautiful towering ceiling and a massive arched roof. There is also a Chabad in Berlin, at Muensterschestrasse 6, which houses the Jewish Educational Center. The Center provides programming that includes services, a kindergarten and grade school, programs for adults and children, and also a kosher restuarant. These sights aside, the main center of Jewry in Berlin continues to be in the western part of the city. Notable synagogues include the Liberal congregation on Pestalozzistrasse, a Romanesque building restored after the war with stained glass and four large alcoves. The Orthodox shul on Joachimstalerstrasse, built in 1902, is also known for its beauty. On the site of the former Beit Zion Synagogue destroyed in the November pogroms, at Brunnenstrasse 33, sits the Orthodox Yeshivas Beis Zion which currently educates a number of young Orthodox men. In addition, Congregation Adass Jisroel was reestablished in 1989 at Tucholskystrasse 40, and includes a kosher Beth Cafe (coffeeshop), and a kosher market, Kolbo, that specializes in prepared foods and Israeli wines. The Jewish Museum Berlin in the Kreuzberg district, a division of the Berlin museum, officially opened in 2001 and is notable both for its location and its contents. It is located on Lindenstrasse and contains a stirring Holocaust exhibit, as well as a myriad of Judaic items and artifacts some more than 800 years old. The museum also features the Libeskind Building, designed and built by architect Daniel Libeskind. His design was modeled after a deconstructed Magen David (Star of David), and in Fall 2007, Libeskind’s Glass Courtyard, based on a sukkah opened, whose roof spans the 7,000-square-foot inner courtyard of the Old Building. The museum also awards an annual prize for Understanding and Tolerance to individuals promoting these virtues. Jewish cultural events are easy to find. Theaters in Berlin often feature shows with Jewish content, and Israeli troupes and orchestras regularly tour in the city. The community center on Oranienburgerstrasse, and a second one on Fasanenstrasse, also sponsor numerous cultural events. There are Jewish Culture Days that feature theater, concerts, films, lectures, and exhibitions, as well as the annual Jewish Film Festival Berlin. Bimah, the Jewish theater troupe, also performs traditional East European plays as well as contemporary Israeli drama pieces. The Berlinische Galerie, located adjacent to the Jewish Museum at Alte Jakobstrasse 124-128, houses works by Jewish artists, including Max Beckmann, Max Libermann, El Lissitsky, Felix Nussbaum, Else Neulander Simon, and Erich Salomon. Near the Brandenburg Gate and the new American Embassy lies the Memorial to the Murdered Jews of Europe, built by architect Peter Eisenman, which consists of 2,711 slabs of gray concrete, some rising as high as 13 feet. Under the memorial is the “Ort der Erinnerung,” a small museum dedicated to the Holocaust. One of the most haunting and significant places of Jewish interest in Berlin is the Wannsee Conference House. It was in this house in January 1942 that Reinhardt Heydrich, Adolf Eichmann and others engineered their "Final Solution", making their plans to rid the world of Jews and Jewish culture. The house today is a memorial and an educational center. Berlin is home to the the Weissensee Cemetary, the largest Jewish Cemetary in Europe. The cemetary is home to over 115,000 graves of Jewish individuals and was in use from the mid 1800's until the advent of the Holocaust. Jewish immigration to Berlin increased in 2005, especially for Soviet Jews. In the summer of 2005, the German government and the Central Council of Jews in Germany decided to allow Jews into the country only if they will be an asset to the pre-existing Jewish community. Until 2005, the German government considered an immigrant to be a Jew if at least the immigrant’s father was Jewish. Under the new restrictions, half of the annual amount of Soviet Jewish immigrants were not welcomed into Germany. Also, Dieter Graumann, a member of the Central Council, declared that Soviet Jews will not be considered “refugees.” Because of Israel’s law of automatic citizenship for Jews, the Soviet Jews who cannot immigrate to Germany also have the option of immigration to Israel. Since the establishment of the State of Israel, there has always been a place for Jews fleeing the Diaspora. Therefore, no Jew can qualify as a refugee, and Germany is not required to take them in. Two Berlin-born Palestinian men were charged with planning attacks on the Israeli embassy and other Jewish institutions by a public prosecutor in Berlin, in December 2015. Mohamed El-N and Ali El-I, both 21 years old, were charged with “planning a massive act of violence,” after their plans to bomb local synagogues and the Israeli embassy were reported to police. The men were arrested in July 2015, and the trial began on December 15, 2015. Open to the public on Thurs. from 2-6pm & Sun. 12-4pm. Embassy of the Federal Republic of Germany, Washington, D.C.
Mendelsohn’s grave, Berlin monuments, and Reichstag photos courtesy of Philip Greenspun at www.photo.net. Holocaust Memorial in Jewish Cemetery in Berlin photos courtesy of Sue Arns at Jewish Touring Berlin.